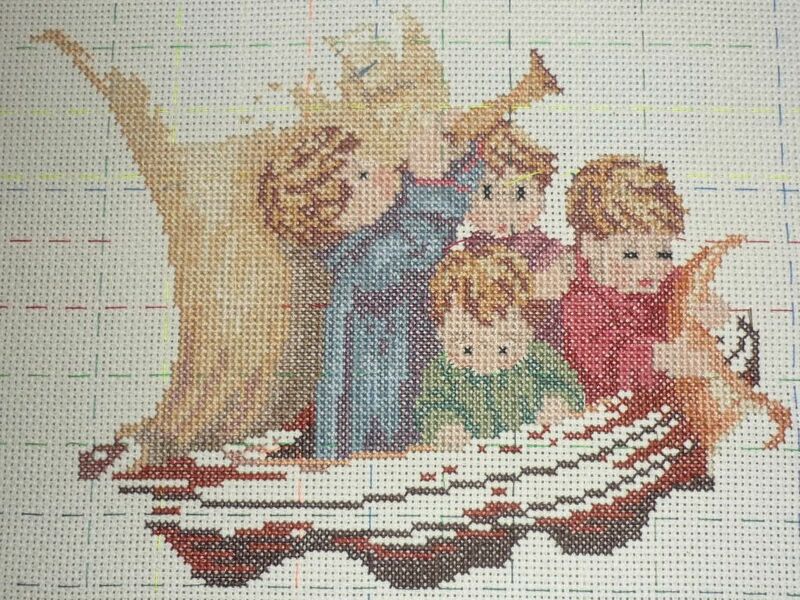 Naughts & Cross stitches: Hummel and Babysitting! Well it has been a very productive evening. I was asking to baby sit this evening as my friend had to take her daughter to a concert (school) and really didn't want to have to take the boys as well. So after teaching this afternoon I head over to her house to find the boys in a wonderful mood. It was quite a lazy evening, a little bit of homework left to do and then bedtime. The oldest put himself to bed and the youngest got a story and then lights out. I then set myself up under her craft lamp and that is where I was found having done quite a lot of Land In Sight! The boat is actually starting to appear as a boat! they are no longer floating in mid air. Which really doesn't work very well for them. It was a very nice way to spend an evening babysitting. I realise that I enjoy taking photos as I do my work so I can see how much I've actually done in a session I can see the progress. On a totally different note, I am feeling very lonely at the moment. My fiance has gone boating for the week and he is sleeping on a boat somewhere North while I am left to work. Although it is productive I miss being able to talk to him whenever I want. He is such a sweetie, and he always has a good nod for my crafts though I think he really doesn't understand my drive to craft. I remain ever hopeful of getting him to actually participate and do some crafts with me. I got him to pick up a crochet hook once but that didn't last for very long. Oh well, time for bed.